Crazy by name crazy by nature, CRAZY P fuses a mix of discoid underground magic with deep electric house, glittering pop and much much more. Lex Wolf and Negghead of ACID MONDAYS are known for bringing hallucinogenic house and techno global. Other artists include Brina Knauss and elrow regular, Toni Varga. Bomans will deliver raw, playful and glistening soul. Tini Gessler and Guillem Ruiz b2b Viral offering some killer disco classics. 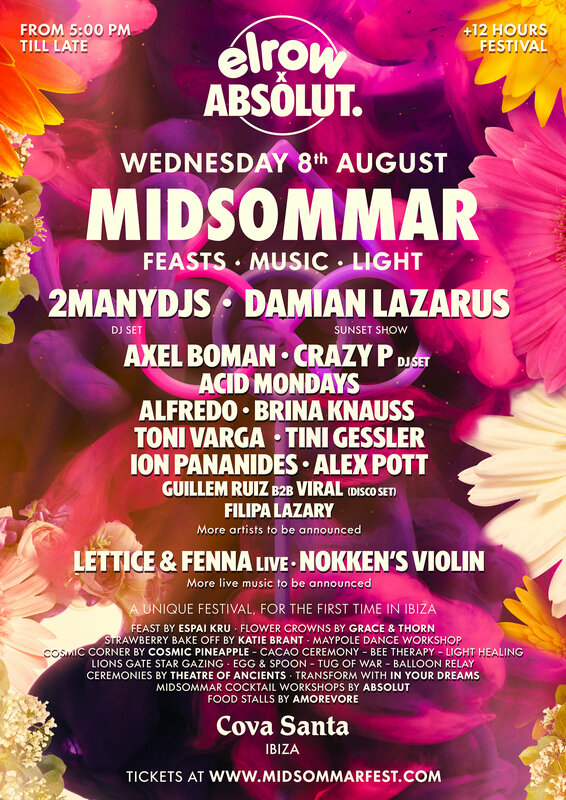 In what’s set to be the most memorable event of the summer, elrow has joined forces with Absolut to encapture the spirit of Midsommar bring a flavour of Scandinavian inspired magic to Ibiza, with a unique celebration of Midsommar. The event will be taking place onWednesday 8th August at Cova Santa – the al fresco venue, etched into cliffside of San Josep, will be transformed into a floral, sun filled paradise to celebrate this Pagan tradition, but in typical elrow style – expect it to be an enchanting affair! elrow is an award-winning experiential event concept and party series founded in 2010 by Cruz and Juan Arnau Lasierra; the sixth generation from a dynasty of entrepreneurs also responsible for creating Monegros Festival and legendary Club Florida 135 in Fraga, Spain. From their head-quarters in Barcelona, elrow have taken the world by storm with their unforgettable party style, pairing elaborate production, interactive performers and zany characters with the best electronic music, placing them as a global reference for circus inspired parties with tickets to the visual spectaculars usually selling out in minutes. A myriad of different themes and concepts makeup elrow’s zeitgeist with sub-brands including ‘Rowlympics’; their own take on the Olympic games, their Brazilian jungle carnival theme, ‘Sambodromo de Brasil’ and flag-ship theme ’Singermorning’. Absolut Vodka is one of the most famous vodkas in the world. Launched in the US in 1979, it completely redefined the premium vodka landscape. Through collaborations with artists like Andy Warhol, Keith Herring, and Spike Jonze Absolut soon became synonymous with art, culture, and nightlife. And by starting a revolution in the cocktail creation and launching a range of flavors never seen before, Absolut gained the iconic status it still preserves today. The Absolut Company is a part of Pernod Ricard, which holds one of the most prestigious brand portfolios in the sector.